This Fred and Wilma Flintstone Costume is the best couples costume since prehistoric times! Dress up as the easily recognizable and lovable cartoon characters Fred and Wilma. Yabba Dabba Doo! 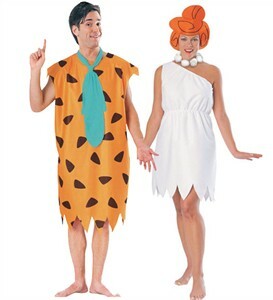 Fred Flintstone costume comes with a tie and tunic and Wilma Costume comes with dress, necklace, and headpiece. Availability: This Fred and Wilma Couples Costumes usually ships within 1 business day. Fred (Standard) 42" 30"-34" 33"
Fred (X-Large) 46" 36"-40" 33"